MARYCRIS S. OPLAS, Managing Partner of Alas Oplas & Co., CPAs, elected as the new board member to a 3 years term in the recent ASIA PACIFIC Conference of BKR International at Chengdu China. Ms. Oplas areas of expertise are taxation and audit. She has handled issues like tax investigations and tax advisory services through a thorough understanding of business activities. Her reviews on procedures and controls of specific business process allow the company to identify the key risks and enable implementation of improvements to monitor and manage business process and technology risks. One of her work philosophy is to develop a close relationship with clients so that they can be advised on company plans and transactions related to day-to-day business activities. Her broad experience consists of her assistance to different companies with the selection. 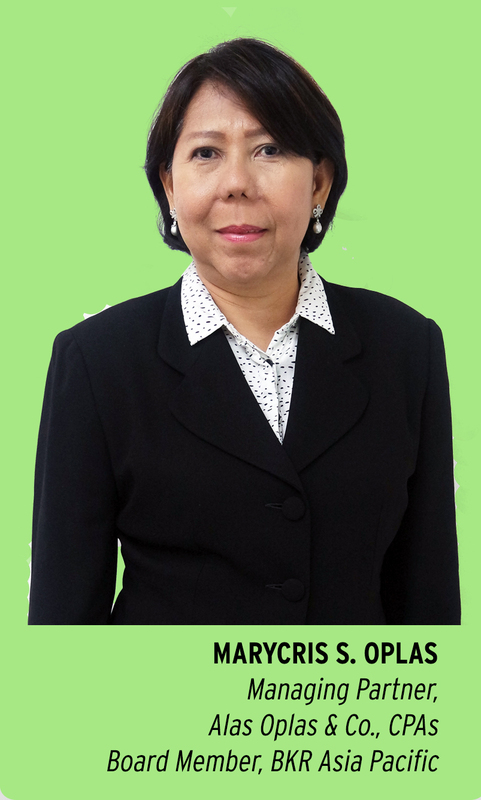 She brings on board a rich experience and mastery in the field of tax and audit in over 20 years in the profession at leading audit firm in the Philippines.